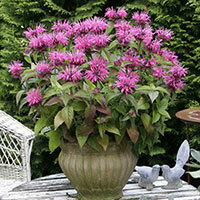 Monarda ' Cranberry lace is a great plant for the border, on the balcony or on the terrace. The plant smells delicious and the leaf is also used to oil out of it, which is used for aromatherapy. 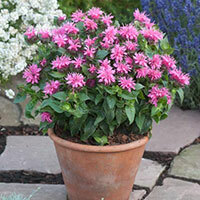 Monarda could also naturalise very fine. Plant with a good color effect and beautiful shape, for an airy, well manured soil. To complete the border.For a warm sunny place, occasional drought enduring. Please note that a lot of moisture in the winter can fall away. A species with velvety magenta red flowers heads that above deep colored, almost carmine red bracts. A great color explosion. The foliage of which even the veins are red signed is never affected by mildew. Less high than most. As the name implies is the colour intense pink, almost lippestiftroze, with the sepals purple discoloration. 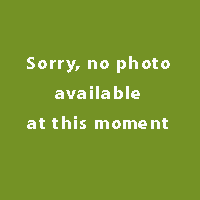 Forms neat palithasaliyam of only 40 cm height set with crispy-like dark green leaves. Indispensable border plant with fragrant leaf which best thrive on moist sandy soil. After three years best to maintain a good bloom once parts.The flowers are colored, tubular blades are bottom of a flower head. Also the colored bracts give the plant an extra advantage. Variety with little pink flowers, that is sensitive to mildew. flowers June-August with large Crimson flowers the flowers are clear top sheet on thick stems.Good cut flower.Unfortunately, this species is sensitive to mildew.Regular cracks for good growth. Very compact plant with purple-pink flowers. Blooms well even as a young plant. Good mildew resistance. Clumping, upright stems of aromatic foliage topped with fountain-like heads of hooded flowers. Raspberry Wine' prefers average to moist, organically rich, well-drained soil in full sun. Do not let the soil dry out. Needs good air circulation. Deadhead to prolong flowering season. Has creeping rhizomes that usually form in clumps. Propagated by seed and division every 2-3 years. Best used in mass plantings in perennial gardens, cutting gardens and along streams.